This is a presentation was given at Expanded Learning Horizons Conference (#ELHSTECH) a few weeks ago as part of a TIM (The Idea Matters) Talk. After a number of discussions since then I have decided to add the presentation here to continue the conversation. Please be aware that these thoughts are my own based on a number of readings which are listed at the bottom for you to peruse at your leisure…. While the visuals are not necessary if you are like me you find them a way to bring home the statement’s being said. I have coloured the text Purple where I was moving to the next visual in the Prezi. Please feel free to interrupt me as we take a journey through my thoughts about technology in assessment and learning and the idea that Pen and Paper are soooo last year and we need to move forward into the future with assessment practices. As more and more devices are available to students and schools, and technology becomes more a part of everyday teaching and learning. How do we enhance assessment practices using technology? In order to answer the how we need to be able to answer the why? Why do we assess what we are assessing? Why do we want to? What is the benefit? And what are we enhancing? I believe it all lies in what we are assessing and why we are assessing. 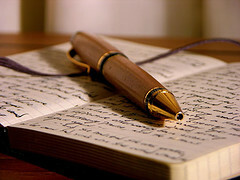 In the past assessment has been completed using the technology of pen and paper. We assessed (and in some cases still assess) using multiple choice, short response, essays and speeches. The point of the assessment was to assess knowledge, memorize key facts and figures. It was all about broadening a student’s common knowledge about the world and the particular discipline that is taught. Essentially we were checking what kids know and the lower order thinking skills. As technology became more accessible most teachers ” Just Added ICT” so we substituted in PowerPoint presentations instead of speeches and instead of asking our students to handwrite those essays and reports we told them to type them up in Word. Why? Cause we can and cause we were told to. As a result there was no improvement to teaching and learning instead we just had pretty pictures to improve the reading experience. The more advanced users of technology over the last few years have been exploring other uses of technology in assessment practices. This means that speeches have turned into multimodal assessment instruments. And these multimodal assessment items incorporated a wide range of Web 2 tools, techniques and skills. Students use OneNote to record reflections, research, or revision notes. Some teachers have even started to feel like they were more comfortable and started allowing students to have some choice. Assessment pieces were augmented to have functional improvement and teachers moved to completely modifying the task to fit that cool tool they had just found or learnt about at the latest tech PD session. But Why? We are still asking students to regurgitate facts and figures. Only now we were also asking them to add some technology. In some cases we started introducing higher order thinking skills and 21st century skills. Choice at least allowed both staff and students to enjoy the assessment task just that little bit more. This brings me to where we are today in most schools in most assessment practices… Pen and Paper exams, Just Add ICT assignments and a handful of brave teachers augmenting and modifying assessment tasks to include cool tools for schools . All of this at the end of the day is still just assessment of learning. So where do we go to now? How do we enhance our assessment practices using technology? The answer is we need to redefine assessment. Assessment needs to move from assessment of learning to assessment for learning. When teachers stop assessing at the end of a unit or topic and move to assessing the journey students travel to understand and know the topic only then can we incorporated technology into all forms of teaching and learning. We need to forget about the exams, orals, presentations and start to value the skills, analysis and collaboration. We need to look at the higher order thinking skills. The future of technology in assessment, in teaching and learning means we need to rethink assessment. Where in the “real world” are you asked to memorise the answer? If you don’t know the answer you look it up, you Google it, you ask a colleague, a friend, an expert. It doesn’t matter when and where you are if you don’t know the answer you grab the nearest phone, tablet or notebook and look it up. As teachers if we include statistics or large quantities of text as stimulus we are often queried as to why we are being soft on students. Open book exams limit students to all they can fit onto a single A4 piece of paper. In 2009 Denmark trialled the use of computers in final national exams. These computers were not locked down at all; students had access to the internet, and all the programs on the computer. The only condition was that there is no communicating with the students in the exam. They cannot email or chat with the students in the room. This has led to the teachers having to rethink the nature of the questions. The questions cannot be ones that can simply be typed into Google and the answer regurgitated. The use of technology in this manner reflects how students use technology in their everyday lives. So why aren’t exams open book when life is an open book? We need to redefine assessment. Assessment needs to be new tasks that don’t ask our students to memorise the facts and figures but ask our students to use the higher order thinking skills to solve problems, real world problems. Why do we need to follow the 20th century model of every child entering school at the age of 5 and exiting at 18? Why does every child have to sit the exam at the same time on the same day? As adults we learn at different rates we test ourselves at different times. Why don’t we ask the same of our children? Students should be able to be assessed when they are ready instead of when the teacher says they should be ready. We need to allow easy access to technology and teach students the 21 st century skills they will need now and into the future. We need to assess the skills especially the skills of communication , collaboration , filtering , and globalisation . If were really do believe that assessment is FOR learning then technology is going to be the key to access information. Students will be learning by doing. Investigating the topic whether in exam conditions or in the freedom of their own home as long as they have the technology they will be able to arrive at the same conclusion. We are moving to a time where there is anytime anywhere learning. Why can’t students take a lecture from Steven Levitt in America about economics theory as it relates to everyday life? At midnight if necessary? This would allow students to learn from the best of the best. If assessment is for learning then we need to give students opportunities to continually reassess. If students don’t get it right the first time then what is the harm in having another go? This is where technology can really be useful so students don’t have to “start again” and the technology can help us to keep track. Technology and learning needs to become ubiquitous and decentralized. This is where technology is going to assist the most. Who cares if the kids access it from a phone, tablet, or notebook as long as they have access to what they need to learn. The discrepancies between what educators think is right and what happens in schools has to do with the standardized testing and accountability. If educators think about the options they have to enhance assessment practices students can learn and be assessed through gamification of tasks, constructing their own textbooks and learning, assessment portfolios, game simulations, role plays, and real life scenarios, sometime in the future even virtual reality will be a way to assess student learning. As I bring myself back to the reality of the 2012 classroom I realise you want to know what you can do today, now in your classroom. How you can enhance your assessment items with technology… if there are any here you want to investigate a little bit further I’m happy to show you an example if I can. You don’t know what you don’t know! What if I don’t know the answer? The students won’t know anything. Students will misbehave if we give them this freedom. How are we going to keep them on task? How do we stop students from cheating? Students will abuse the system. How do I check in with every student every day? There is enough to do with implementing the Australian Curriculum how am I going to find time to recreate my assessment pieces as well? How long til we move on to the next new thing? What’s the minimum we have to do so the powers that be don’t ask us to do more work? How about you start learning with the students. Is what you are doing now working? Learning needs to be such that students have the want and the need to learn. Why do students want to take a short cut and cheat? How do you currently check in that students are working? Teaching is about trying new things. If you no longer want to implement another new thing I think it’s time to leave the profession. Rethinking assessment, incorporating technology changing the way we teach and how students learn leads to creating lifelong learners who have an imagination. And it is with these new ideas, that new products are created and the world has more entrepreneurs who bring us great products like the iPad. When we rethink assessment and incorporate technology we teach students the skills they require for life and thus are prepared for the “real World”. To move to this stage where assessment is for learning we are going to have to push our educational authorities. Start small change your assessment tasks in your junior subjects (in most states these don’t have external moderation). Use problem based learning where the assessment is about the journey the questions the kids ask and how they go about answering the questions. Ask students to create the curriculum for a unit. Move away from the sage on the stage to be the guide on the side. Investigate 20% time in your course. Limit yourself to direct teaching for 15 minutes per lesson. Learn with your students. Challenge your students to think for themselves. Teach them how to form their own opinions based on facts and research. I challenge you to make one change to your practices each term. As more and more devices are available to students and schools, and technology becomes part of everyday teaching and learning. I challenge you how do we enhance assessment practices using technology? When are we going to move forward into this 21st century we all talk about? When is Pen and paper going to be sooooooooooooooo last year ? Godin, S., 2012. Stop Stealing Dreams. s.l. :Do You Zoom Inc.
Rshaid, G., 2011. Learning for the Future Rethinking Schools for the 21st Century. Englewood: The Leadership and Learning Centre. It’s All in the Past!